This article will illustrate the difference between a traditional body shop repair and the repair process with Columbia Dent Center. ​The picture above shows a the roof of a Toyota Corolla. The damage on this roof was resulted from a child walking across the roof of the car. This repair is a perfect example of how our minor auto body repair process can save you money and get your car back to you the same day you drop it off. Below, we outline the repair process for a traditional auto body repair vs. a minor repair process. Had this car gone to a traditional auto body shop, the cost for this repair would have been close to $1000 and you would be without your car for several days. First, a traditional auto body repair shop would have the windshield removed. Then they would have to sand off the paint and fill the dented area with a plastic filler. 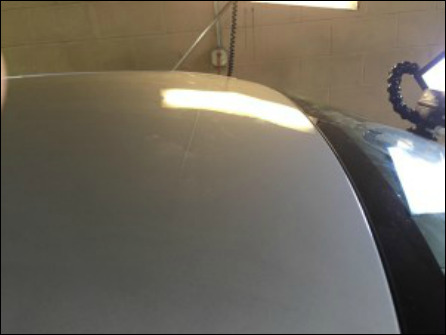 After the filler dried, they would have to sand the filler to make it level with the rest of the roof, apply primer and sand some more to remove any minor imperfections before preparing the car for the painting process. 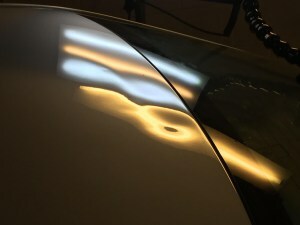 After painting the car and allowing the paint finish to bake on in a heated paint booth, the car would then be inspected for any flaws in the painted finish. Those flaws would be sanded out and polished before having the windshield re-installed. Since body shops don’t specialize in glass replacement, they have a glass company handle this for them. Just scheduling the removal and re-installation of the windshield will require them to have your car f 2 to 3 days. The repair process would take up at least 1 more day. The cost of the windshield operation alone would be between $200 and $300. The cost of paint and supplies would be over $400 and the labor for the repair would be over $200. In the end, you car would be in the shop for a week and the cost would be around$1000. Even if your insurance paid, the body shop would hold you responsible for paying the part that your insurance doesn’t pay (most people have a $500 insurance deductible). Our process is extremely simple! We would lower your cars inner headliner in order to access the underside of the dented area. Next we would use Paintless Dent Repair to remove the dent. This process leaves your existing paint finish intact along with your factory paint warranty. After insuring that the dent has been completely removed, the headliner is re-attached to the roof of your car and your car is ready. The minor auto body repair process is completed in one day. The cost for this repair is around $300 and your car is returned to you with minimal downtime.